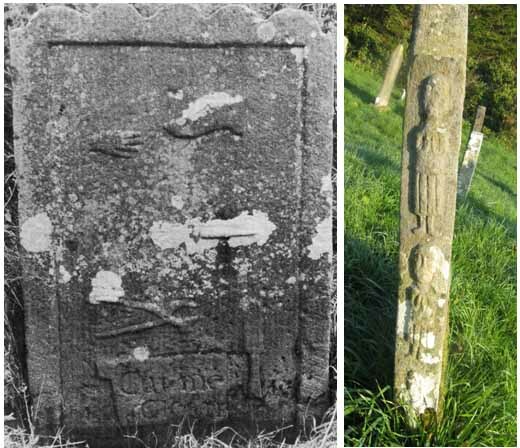 Tydavnet graveyard contains some of the most highly decorated eighteenth century headstones in Ireland. Many decorative motifs are used but mortality stones, which display the scull and crossbones, the hourglass, coffin and bell are the most common type present. The purpose of these symbols was to remind the viewers of their own mortality and thus urge them to prepare their souls for this eventuality. The earliest surviving memorial in Tydavnet was erected to John Foster who died in 1677. The memorial consists of a highly decorated recumbent slab and lies over the entrance of a stone built vault. Several years ago one of the corners of the vault collapsed and for a short time the interior of the structure was visible. It consisted of a short flight of steps which led down to a small rectangular chamber. This was covered by a barrel vaulted roof. Although only one is commerated on the graveslab the vault contained the remains of about twenty individuals. The Forsters were one of the many English and Scottish families to receive dispossessed Irish lands in Monaghan during the 17th century. The beginnings of mortality symbols can be traced to western European art and literature in the period following the Black Death in the 14th century. The funerary art of 17th and 18th century Ulster is closely associated with similar work in Scotland and is most probable a direct result of the Ulster Plantation when many Scottish immigrants settled here. Mortality emblems and heraldic crests are the most commonly used motifs but tradesman’s tools; Adam and Eve scenes and winged cherubs were also commonly used. The tradesmen’s tools are of special interest because they sometimes provide information about tools which is unobtainable from other sources. A memorial to Terence Clemence dating back to 1782 has all the tools of trade of a cobbler. The tools shown are the pliers awl and knife. A small protuberance on one of the claws of the pliers indicates that it also served as a hammer for the small nails or sprigs used in shoemaking. Footwear depicted takes the form of an ankle boot with a very narrow heel. This could be the Brogue that was the most common type of footwear worn by the native Irish during the 18th and 19th centuries. This is of great historical importance as (Lucas 1956) in his survey of Irish footwear states that although there is ample reference to the brogue little is known of its actual appearance. The depiction of a glove is also of special interest as Rushe (1916) states that in the late 18th century gloves were made by drapers and the carving on this headstone of a glove would indicate that it was part of the cobbler’s trade. Underneath the carvings is the statement ‘Cut me clean’. 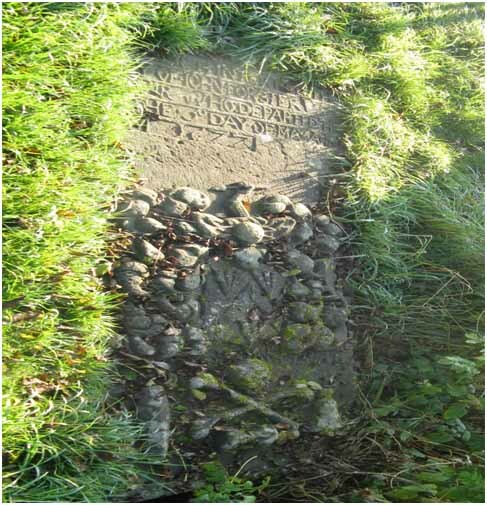 The earliest headstones date to the early 18th century many have extremely fine artwork and some because of their thickness are decorated on all four sides. The back of many of the stones are decorated with family coats of arms above an Adam and Eve scene below. Funerary art flourished during this period principally because there was not any major building of any significance going on such as the erection of churches and big houses. The great church building era did not come until after Catholic emancipation and most of the big houses were built in the 17th century and rebuilt again in the 19th century. The headstone may have been the only outlet for the stone mason with an artistic flair during the 18th century. (Clogher Record 1979,Finbarr Mc Cormack) The memorials in Tydavnet reflect an era of affluence. 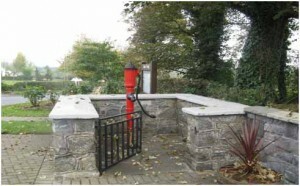 Generally speaking the stone is of excellent quality as is the expertise of the stone cutters. This all points to a degree of affluence in the area of a people who could afford to erect such memorials. 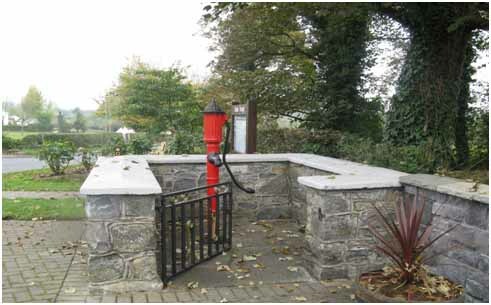 In 2006 a conservation plan for the graveyard was commissioned by the Tidy Towns and drawn up by Professor Mary B. Timoney. We hope our archeological site will be maintained and preserved for future generations to enjoy.